6:30: Story of America: From Bloody Sunday to Moral Mondays (20 min-2015) An excerpt from a work in progress that tries to show how that when opposite sides on America really talk to each other, rather than yell and shout, something amazing is actually possible. Get By (28 min - 2015) looks at two recycling workers, Stanley and Milton, as they bring their struggle for a living wage to the legislature, media, and the streets of Ithaca, New York. With Banners Held High ( 31 min-2014) celebrates the resilience and humor of miners and women who went through the 1984/5 Miners’ Strike. Blood on the Mountain is a film that exposes the environmental and social injustices that have developed from industrial control in West Virginia by the 1% and the corrupted politicians that do their bidding. This is a stunning new film by the team behind "Coal Country." Blood on the Mountain. Get your ticket here, and read more about the program here. 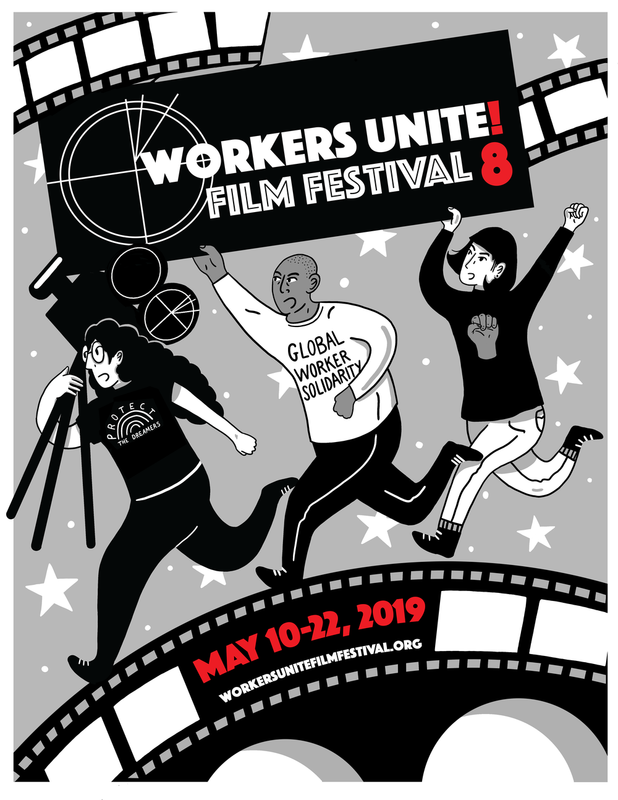 The Murphy Institute for Labor Studies/CUNY is hosting #WUFF15 for a gala and we are using this opportunity to focus on the power of global solidarity by screening Blood Fruit. Blood Fruit is a film about workers who rise up and use the power of a worker strike and ask for a customer boycott to reject South African apartheid's products. Blood Fruit. Get your tickets here, and read more here. Right to Work has become a major threat to unions across the country. These films focus on the battle that took place in Wisconsin. Find out what can be done to fight against right to work in the future and how the labor movement has responded to harsh organizing restrictions. Films featured this evening: Overpass Light Brigade, We are Wisconsin. Get your ticket here, and read more about this program here. On this evening, we will be taking a closer look at how a steel mill impacted the surrounding community and how its closure in 2012 leaves a mark for years to come, followed by an exploration of life as a laundry worker. Get your ticket here, and read more about this program here . Join us for an evening filled with music, history, and female power and artistic expression. Girls in the Band explores the lives and journeys of female musicians in the 1930s. Th e 7PM viewing will be followed by a performance by The Sherrie Maricle Trio - an all women trio led by Ms. Maricle, who is also featured in the film, and an evening of dancing and mingling. Girls in the Band. Get your ticket here for the 5PM viewing or for the 7:30 with an intermission set played by The Sherrie Maricle Trio - an all women trio led by Ms. Maricle - who is in this film. This will be a chance to view a few of the notable shorts from this year all in one block. Get your ticket here, and read more here. Get your ticket here today, and read more here . Screenings will focus on work life and organizing efforts in South Asia and in the South Asian Community here in NYC. Both on the production of something New Yorkers see every single day - manhole covers, withing the domestic worker community and a major work on the output of sweatshop employed child labor in Bangladesh. This is a training for aspiring as well as seasoned filmmakers who want to learn the ins and outs of making an activist political documentary. The bootcamp will be led by documentary filmmakers with years of hands-on experience to help participants understand the inner-workings of making an activist film. Don't miss out on this unique opportunity to learn from the best and get the skill sets you need to make your own film a reality. Show what's happening on your job! Join us! You can purchase your ticket on Eventbrite here, and RSVP here on Facebook. A night of poetry, spoken word and short films around the themes of workers, their lives and their fight to build and save their unions. There will also be a teaser preview performance focused on the lives of laundromat workers in NYC because Every Fold Matters. Films featured: Every Fold Matters, Workers' Theater in NYC, Comedian Lee Camp Tells You What! Get your ticket here. RSVP here on Facebook, read more here. An encore presentation for our Queens audience will be held in the IBEW local 3 Electrical Industry Auditorium. This event is free and open to the public. Two films on electrical workers in Australia, fighting back against a reactionary government and a cautionary tale about the deadly nature of poorly trained temp workers. Judith: Portrait of A Street Vendor speaks to the daily struggles of a street vendor in New York City. Food Chains follows the food trail from farm to your table and highlights the role of exploited labor in our food chain and what we can do to end that exploitation. Battles for food chain justice highlight the issues of workplace rights for immigrants as well as the fight for a living wage for all workers in the U.S. and around the world. The Hand That Feeds is a prize-winning documentary about a courageous effort to empower workers who thought they were powerless to create change. You can purchase your tickets here, and read more here. Connected By Coffee: The story of Latin American coffee farmers and how our daily brew is deeply connected to a troubled past and hopeful future. You'll never drink that first morning cup in the same way again! Get your ticket here today, and Read more here. Soil, Struggle and Justice examines a cooperative of the Brazilian Landless Movement (MST) in the South of Brazil, which struggled for access to land and then transitioned to ecological agriculture, or agroecology. Short films from CASA show how tenants organize for their rights. See how faith-based groups and justice organizations are uniting in NYC for a living wage. Then visit Wilmington, NC to see what the effects of the economic collapse caused by the banks has had on working people who lose their homes. Get your ticket here and read more about this program here. This is a night to recap the history of Eugene V. Debs, a prominent labor organizer who helped build the labor movement. Get your ticket here and Read more here and RSVP. A Time to Care features the daughter of a Long-Term Care (LTC) resident and heartfelt accounts from PSWs and RPNs about the challenges they face providing quality care to residents. Sunset Cruise shows how the elderly and their caregivers often head into uncharted waters as they spend more and more time together in the client's declining years. CARE takes this personal story and expands upon it by following four caregivers, who must not only struggle with their clients' needs, but also with the limitations of long hours, lousy pay and meager benefits for themselves. Get your ticket here and read more on this program here. Resistencia: In 2009, the first coup d'etat in a generation in Central America overthrew the elected president of Honduras. This film focuses on the turmoil that ensued when radical farmers of the Aguan Valley, working the palm oil fields of the most powerful oligarch in Honduras, decided it was time to take back their land. Haiti: The Informal Economy and Poverty, Inc. focus in on the informal economy in Haiti and how the US economically policy negatively impacts developing countries through Non Governmental Organizations and their often misguided efforts at helping the poor overseas. Films featured: Haiti: The Informal Economy and Poverty, Inc.
Get your ticket here, and read more here . Daughters of A Lesser God and Rise of the Oppressed both focus on organizing in the textile and bangle industry in Pakistan, where child labor is rampant. Mass e' Bhat tells the story of a social worker in Bangladesh, from rural beginnings to urban life, as a way to shine a light on the ongoing exploitation of child labor. Save your spot by purchasing your tickets here, join the facebook event, and invite your friends here, and read more here on this program. Cast in India reveals the workers behind the New York City manhole covers which are manufactured in India. Champ of the Camp, a massive production, shines a spotlight on working conditions in the harsh work camps of Dubai, where 17,000 South Asian workers distract themselves from daily hard reality by holding a Bollywood singing contest. This screening is followed by a discussion and book sale with Erik Loomis, an assistant professor at the University of Rhode Island, who will be facilitating a conversation on "Global Issues of Survival, Cooperation and Bollywood Song". Get your ticket here and RSVP on facebook and invite your friends. Frontline Films from the TWU, A series of short films detailing frontline labor issue and solidarity events around NYC and the nation, from ace TWU national videographer, Mary Matthews. Fire Lines - In the face of a major natural disaster - the 2010 Carmel Forest Fire - firefighters from Israel and Palestine put aside decades of suspicion and hostility to unite for a common goal. Is this a one-time fluke? Or can it show the path to a possible dialogue on wider issues? Remembering Salt The story of a small town in Canada that defied McCarthyism with a showing of the blacklisted movie Salt of the Earth. Pride It’s the summer of 1984. Margaret Thatcher is in power and the National Union of Mineworkers is on strike, prompting a London-based group of gay and lesbian activists to raise money to support the strikers’ families. A fantastic retelling of some of the most critical moments in labor history - stirring! With Banners Held High celebrates the resilience and humour of miners and their wives and children who went through the 1984/5 Miners’ Strike. NY Premier Women of the Mine (Mujeres de la Mina) Portrait of three women who live and work in the mines of Cerro Rico, Potosi, Bolivia - a symbol of colonial plunder. Work in the mines belongs to men, yet women are the most precarious and cursed link of the system. Three women open up their lives to us so we can discover their stories of struggle and resistance. Get your tickets here, and read more here. Can't Wear a Wig Forever is a story of a young black women who was fired from a job and her attempt to navigate the path to further employment. Claiming Our Voice: Domestic workers, members of Andolan, find their own power by acting out their stories of exploitation and abuse on the job. She's Beautiful When She's Angry tells the stories of the brilliant and dedicated women who founded the Women's Liberation Movement and have kept fighting for its goals throughout the last 40 years. Can't Wear a Wig Forever: A story of a highly qualified young black women who was fired from a good job and her attempt to navigate the rocky path to further employment. Judith: Portrait of a Street Vendor takes us on an intimate journey into the daily life of Judith, a street vendor from Guatemala who lives and works in New York City. Girls In the Band tells the poignant, untold stories of female jazz and big band instrumentalists and their fascinating, groundbreaking journeys from the late 30s to the present day. Get By explores the fight by municipal workers in Ithaca, NY to unite their community in the fight to get a living wage for their hard and dangerous work. A Day's Work is a searing indictment of the temp employment industry in the U.S., where workers are hired without benefits or training and left to fend for themselves - often with deadly consequences.